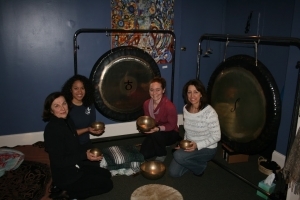 Last week some of the PE staff went to a meditative gong concert at the Conduit Center in East Hartford. I’d been wanting to try it for months, but all day, I kind of felt like it was going to be lame and that I really didn’t want to meditate for 90-minutes. How was the girl whose record meditation is 45-seconds going to lie there for 5,400-seconds? That’s a lot more seconds. Then I walked into the building, went up the stairs and immediately felt good. I saw the familiar faces of our staff and was hit with the feeling of warmth and comfort. Granted it was 30-degrees outside and they had the heat cranking, but they had the heat cranking and it warmed the cockles of my heart. They had me at heat.